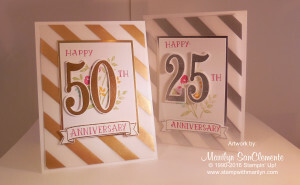 Today I am sharing a silver anniversary card that I made to match the gold Anniversary card I shared a few weeks ago. I love these cards and have added them to my Etsy store. These cards are perfect for an anniversary celebration or an invitation to a special party! The only difference between these two cards is the gold vs. silver vellum that I used for the background! The card base is made using Whisper White cardstock cut the long way – 4 1/4″ x 11, scored at 5 1/2″ and folding in half to open at the top! Next is a 4″ x 5 1/4″ layer of Gold Fancy Foil Vellum! This Vellum just screams Wedding or Anniversary to me! 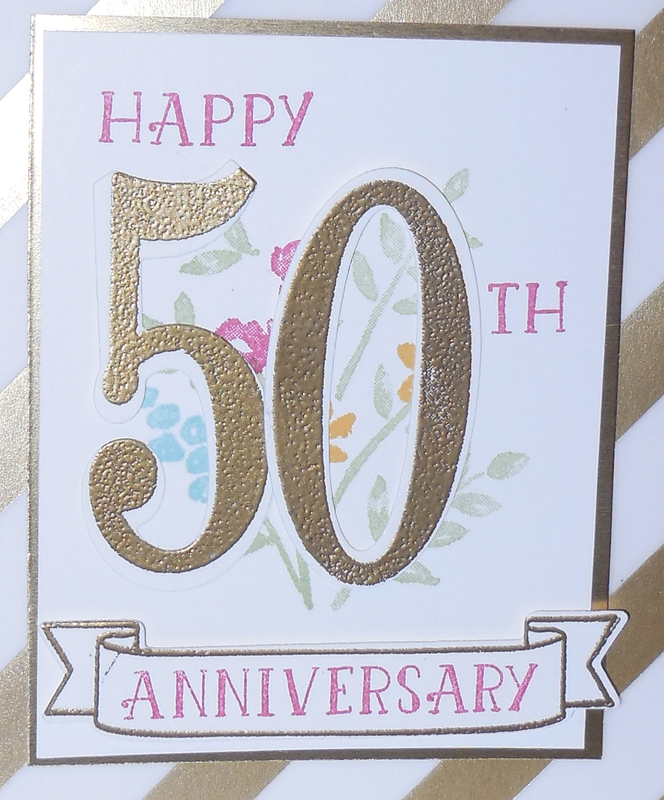 I think that I will add this card and a Silver version to my Etsy store for Anniversary Parties! Next I used the new Number of Years Stamp set with coordinating Large Numbers Framelits from the new Stampin’ Up! Occasions Catalog to stamp the floral bouquet, numbers and the anniversary banner. These items are all stamped on a piece of Whisper White cardstock which has been layered onto a piece of Gold Foil. The Design is stamped with Pear Pizazz ink for the leaves, Rose Red ink for the Roses, Daffodil Delight ink for the daisies and Pool Party ink for the Gladiolas. The words “HAPPY and ANNIVERSARY” are stamped with Rose red ink. 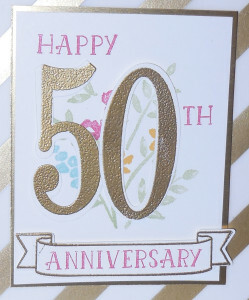 The Banner is stamped with Gold ink and embossed with Gold Embossing powder around the Anniversary. I also stamped the numbers “5” & “0” with Gold ink and embossed them with Gold embossing powder on scraps of whisper white cardstock. Then use the new Large Number Framelits to cut out the numbers and the Anniversary banner. I love when Stampin’ Up! make a stamp set and framelits that coordinate! and don’t forget to get your 15% off by ordering these products in a bundle! Want to make the banner and the numbers pop? I used dimensionals for the banner and the numbers… And a little tip for you – save the thin edges of the dimensionals to use for thin items like the numbers.